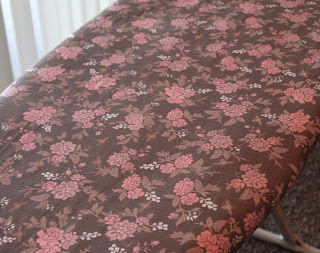 I made this ironing board cover about a month ago...I finally got around to taking pictures just recently. Our ironing board is one of those really cheap ones from Walmart with the lovely light blue cover and super thin lining. The lining was getting so thin that when I ironed it sometimes left the imprint of the metal grate through the lining...that's bad! So I picked up some fabric and Insul-Bright from Joann and found a really easy tutorial. Insul-Bright is a really great product for any project that needs to be heat proof, such as a hot pad. I used this tutorial-take a look at it, it's way more helpful then my step by step below! The entire process took me just over an hour. Trust me, it's easy. First I took the old nasty cover off by removing the string that runs through the whole thing. Be sure to keep the string. Next I laid out my fabric and laid the old cover on top of it. I then traced around the old cover leaving an extra 2 1/2 inches around the edge. I only bought a yard of fabric so I had to piece mine together, you would want about 1 1/2 yards to 2 yards to make it one big piece. Iron a 1" casing around the edge and then sew, leaving enough room for the string with a paper-clip to go through. At the large end of the casing cut a small slit in the fabric, large enough for a safety pin to go through. Attach a safety pin to the string and feed it through your casing all the way around til it comes out the end where you started. 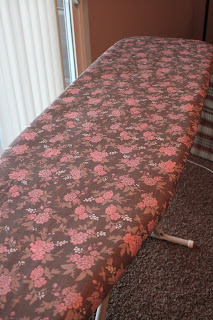 Cut a piece of Insul-Bright large enough to cover the whole ironing board. Use spray glue to attach it to the ironing board. 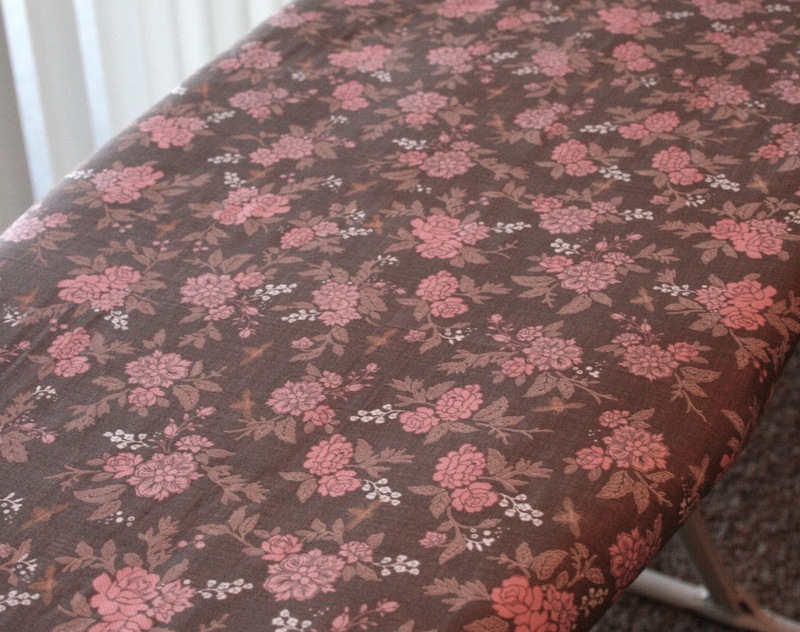 Gather your new cover slightly at the very top and put it on your ironing board. Pull the strings very tight making sure the cover fits well and knot off with a double knot. My explanation is not nearly as good as the tutorial I used...check that one out to see pictures of each step.